My grandmother had 10 children. She regarded her 2-week hospital stays as well-deserved vacations. I tried to adopt her attitude, in between blood draws and worry about the kids back home. After all, we had plenty to celebrate! Dietary Services wheels in a post-labor, steak dinner for 2. What does it say about the frugal household when the hospital towels are whiter and fluffier than your own? Even beef macaroni and jello taste better when served in bed. Especially when you're sleeping on crisp sheets that someone else changed! ...at least until I see the bill! What a great spin , on a hospital stay . Good grief, what hospital was that? They don't make them like that here! Congrats on your handsome son - he looks like a widdle pudge! That is one cute baby you've got yourself there! Congratulations! And take it easy. You deserve it. I am so glad you're back, too. Actually, as far as hospital stays for labor and delivery, your stay looks pretty nice. The hospitals around here (in the Central Illinois area) stopped serving those steak dinners for two a number of years ago, and I have missed them when I had my last three children. And believe it or not, I always had the same attitude as your grandmother. We have NO family help, ever, so to me, the hospital was actually a wonderful break from the demands of a busy household, expecially right after having a baby. I wondered if this newest little one would be jaundiced because I thought that he looked a little jaundiced in the photo you posted the other day, but I didn't know if maybe it was just the lighting in that particular photo. Anyway, so glad you're back home and starting to get back on your feet. Keep posting...I love reading these updates about your sweet new little baby! Glad to her things are going okay. All 6 of mine had jaundice, so I understand. We just nursed alot and found lovely patches of sunshine inside the house to sit in every so often. Looks like you all have a wonderful maternity wing and the services seem pretty darn good. I could never sleep at the hospital, to scratchy of sheets, too many night time visits, and too stiff of matress, LOL. I was always ready to go as soon as the let me leave. Hope things keep going good for you. Leave it to you, Meredith, to make even a hospital stay an elegant experience! ;) I've BTDT on the pre-eclampsia/baby jaundice thing. (((hugs))) to ya! :) You're so funny! And yes,...those bills can make you lose your lunch! I'll be praying his level go down fast. 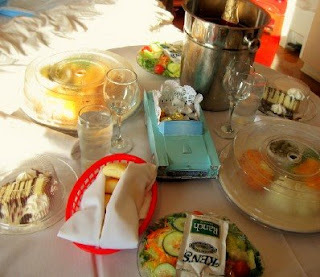 What a lovely meal - I always send for takeout - the hospital is great but not the food! Welcome home, again! That did look like a treat! I am happy to see you made lemonade of lemons! :) Baby looks like a Precious Moments cherub. Too cute! Congratulations on your new addition. I came over through my sister, The Nester. You were spoken so highly of this past weekend at BlissDom'08. I loved this post. Sweet baby...I love chubby babies...mine were almost 9 lbs and almost 10 lbs so I'm a little prejudiced there. Wow a steak dinner for 2!! 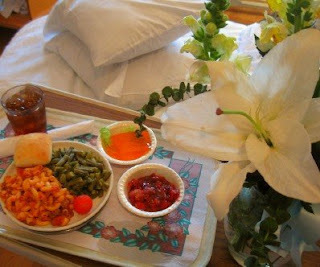 The most memorable hospital post-labor meal I had was VEGETABLE lasagna...nasty! I too considered my short stay in the hospital a "vacation"...read some magazines, bought some late night treats from the vending machine and had them keep my babies in the nursery during the night. I knew I was gonna have them all to myself for a long time afterwards and figured I needed whatever extra sleep I got by having them in the nursery at night (brought in for feedings). Glad you had a good attitude! I hope your sweet little guy wins that fight! It sounds like y'all are doing well~blessings! What a wonderful attitude! Beautiful baby as well! Our daughter had jaundice and as the weather was brilliant sunshine the nurses put her little cot under the window and let the sun do it's work, mind you that was 24 years ago now! I got to stay for 7 days. (I most certainly did regard it as a holiday!) Your little one is absolutely beautiful! I told my husband the hospital stay was as close as I was going to get to a spa so I too tried to enjoy it all I could. Your baby is too precious! Love the fat rolls! I'm glad you and the baby are well. He is so sweet and juicy. Those cheeks scream, "Kiss me"! Rejoicing and praising God for your latest blessing! I know, I know....the bill!!! It does look as though you were taken very good care of during your stay, Meredith. I pray these first few weeks home go well for you. Will you have anyone to help you for a while? Yup! That's one way to look at it. Hope you are taking it easy and not trying to do too much. Those baby cheeks look made for kissing! Maybe the most enjoyable and most expensive vacation you've ever had?! Ah, but it was so worth it. Absolutely love the photo of baby John with his 'shades' on. That baby is so sweet looking! I have been writing some blog posts about health care and hospital visits. You might want to check them out. My husband had a recent visit too. I am so sorry you will have a big bill from this. Somehow I was under the impression that you had very good health insurance and I was hoping your portion would be small. I am glad you received a nice steak meal (sorry, but someone would have had to brought me takeout to take the place of that macaroni-jello mess! 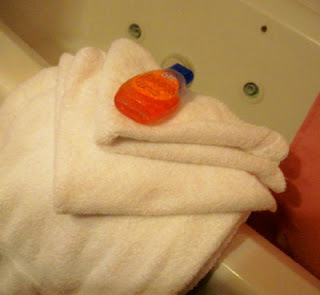 )and that the towels weren't cheap and thin like most hospital towels. I have never had hospital towels that remotely compared to my fluffy stack at home. It does sound like there were some perks even if you were having to spend a very long time in the hospital. I hope you and the baby are on your way to a full recovery! what does it say about frugality when the towels are fluffier than yours? it says you line dry them! :) so glad you are home and what a good attitude you have! when my second was born last december, i thought i wanted to stay the 2 nights they recommend. after the first night, i was begging to go home! our hospital is wonderful and the care the baby and i had and my older child had at home were great, but i still wanted out! He is so cute! So cuddly and soft looking I could just eat him up. Congrats! Oh, that does look like a nice pseudo-vacation! I'm glad you were treated so nicely in the hospital. And how cute does the baby look with his little sun-shade thingy! I'm really jealous- and then I remember the soreness and sleepness nights that come on the heels of birthing babies. Sigh. Love the little prince. He's adorable. What a precious little one. Your baby is beautiful- sooo precious! Way to look on the bright side! I must admit, I do enjoy those several days of someone else doing the cooking and cleaning up when I'm in the hospital. Congrats on your new one. 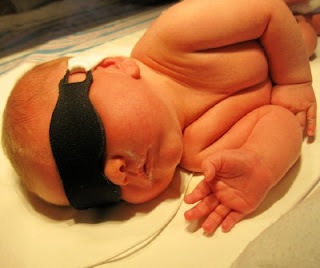 My first baby had severe jaundice also and was in the hospital soaking up the rays for a week. You've got such a good attitude for seeing it as a vacation. I certainly felt un-vacation-like. It's nice to see that your baby had decent eye protection. Back in 2004, mine got shades that attached via stick on velcro dots to the temples. They never stayed on my hairy boy! Oh look at all that beautiful baby chub! I could just squeeze him and kiss him. Accept that you would probably call the police because you have no idea who I am... I'm a faithful lurker! I'm due with my fifth Feb. 26th. Blessings on you and prayers for the biliruben. What a cute ball of chub! I'll be praying for the jaundiced part. My granddaughter also had jaundice with high bilirubin levels when she was born, which meant frequent trips to the doctor in the week following her birth. No week long hospital stay for her! My daughter lives in the Nashville area, too, but I sure didn't see any luxury where her baby was born. The baby was a big baby, as well, at 10 lbs., 2 ozs. Do big babies tend to have high bilirubin levels? I will say that our city is like the hospital capital of America, and birthing centers are prime grounds for competition! Last time I didn't notice an extra charge for the special dinner; I think it is one of those perks to attract patients. This small hospital actually has real cooks making real food, though, unlike the ARAMARK commercial kitchens elsewhere. One lunch was fresh fried catfish, corn fritters, fresh real turnip greens and white beans with cole slaw on the side and an apple fritter for dessert. If you don't like that kind of food, though, you were out of luck! John's bilirubin levels rose so high, so fast that they required hospital-grade bili lights. When levels get to 20 doctors start worrying about brain damage. Both my other kids had jaundice too severe to just watch, but treatable with home therapy lights. We don't know why my kids have all had jaundice, other than that I'm O- and they're all A or O +. Our doctor thinks it's just some unknown maternal blood factor that causes the problem. Well, Meredith, now I've seen it all. You can even bring out appeal in a longish, more-often-than-not lumpy-bed hospital stay! It looks lovely! Your baby is beautiful, and your cheerful humor tells that you must be doing well. Hope so. I love your posts! It is so nice to have you back! I know your family is glad. Enjoy your new fella! He is beautiful. Didn't your last baby also have jaundice problems? I wonder if its genetic. I am very aware that high bilirubin levels can cause brain damage, and that really concerned me with my granddaughter. Hers got pretty high, but trips to the dr. for monitoring and sun and lights at home were all that was recommended. I can, though, see where an ins. co. might approve a week long stay for the infant, but did you have complications as well? Most ins. cos. are so unwilling to bend their rules! In this day and age, a week's hospital stay for delivery is almost unheard of. I had a lot of bleeding after delivery that required more than the 24-hours I took with Elise's birth! I was technically discharged after the first few days, but was able to stay in the same private room with baby. The labor and delivery wing was not full that week. I could sleep in the bed right next to his incubator, continued to receive meals as his "guest," and had all the support the friendly nurses were so kind to give both of us. If you have to stay in the hospital, this was truly the best case scenario. Actually, I don't think that was wonderful but a blatant insurance fraud when seriously ill people have to go home in terrible condition because their "good" insurance refuses to let them stay longer. I am speaking from a recent family experience (she had to go home 23 hours after a mastectomy with tubes still in, in tremendous pain, and a 3-hour trip to get home). I am sorry you and the baby had complications and glad you were granted the extra time you needed to recover from your problems but don't understand why you were allowed to stay in the hospital and be fed and cared for just because your son had to be in the hospital. I think we should all try to get insurance with your company! I am not trying to be mean spirited. I simply don't understand. I am shocked that you would call this blatant insurance fraud--and then say you don't wish to be mean spirited. I was officially discharged from the hospital a few days before the baby. I was not billed for his room. It is common practice to let a breastfeeding mother room in with the baby when there is space available on the labor and delivery floor. Otherwise I would have been camped out in a waiting room 24/7 while the bed next to his incubator went empty. I can understand where the anonymous commenter is coming from. But its apples and oranges. And its largely up to the doc when a mastectomy patient goes home. So, ya can't argue its insurance fraud. That's just plain wrong. I am glad you had such a welcoming hospital, other hospitals should take note. I apologize for the comment about the ins. I misunderstood. I thought that the ins. co. approved your longer stay because the baby needed to be there. I did not realize you were a guest of the hospital. That was, indeed, generous of them. Again, my intent was not be malicious; I was just amazed the stay was approved. I hope you and the baby are doing well now. Let me say congratulations on your new son! He is just precious! I would have loved to have had the treatment you received after the birth of your son when I had mine 2 years ago. And be grateful you have good insurance---I can't imagine being allowed to stay in the hospital that long! I am about to become uninsured (with a 2 yr old) unless I find a policy I can afford to carry on my own, which is very difficult. My insurance benefits as a widow will expire in Jan., so I am in a panic as to how to provide my family with health insurance. There isn't much wiggle room in my budget now, certainly not enough to pay $500-$700 per month for insurance! So any insurance would look good right now, with or without a steak dinner!! Congratulations on the new addition to your family! Lovely baby- I am glad the levels are going down. The hospitals in this area actually encourage mothers of babies who breastfeed to stay as "guests". They feel that the staff that it takes to care for a tiny one and the effort it takes to breastfeed on demand is well worth the hospital bed. My dd got one when her son was kept overnight at John Hopkins when he was seven months old. Makes sense to me.... health care is supposed to be about getting you out sooner and if the baby is calmer- then they can go home sooner! I am SO glad he is progessing. Interesting thought on the blood types....I will have to let my dd know.